World champion Stuart Bingham has been knocked out of the China Open, losing 5-1 to Ricky Walden in the quarter-finals in Beijing. Walden, 33, who lost in the final of the Players Championship on Sunday, made breaks of 60, 55, 67 and 79 and will now play Scotland's John Higgins. The four-time world champion defeated Thailand's Noppon Saengkham 5-3. 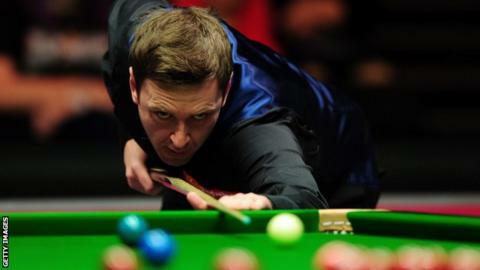 Judd Trump beat fellow Englishman Mark King 5-3 and Scotland's Stephen Maguire won 5-1 against England's Alfie Burden. Maguire's victory takes him above Ding Junhui into 16th place in the world rankings to guarantee his place in the World Championship in Sheffield later this month. However, it means that Ding, a former world number one and winner of 11 ranking titles, has to enter World Championship qualifying and will need to win three matches to earn his spot at the Crucible. Bingham, second in the world rankings, has not won a ranking event since winning the world championship last May. Englishman Walden is 10th in the world and is aiming for the fourth ranking title of his career after wins at the 2008 Shanghai Masters, the 2012 Wuxi Classic and the 2014 International Championship. Both Trump and Maguire have won the China Open before, Trump in 2011 and Maguire in 2008.